25 Years of Digital Technology: What Is Your Place in This Brave New World? 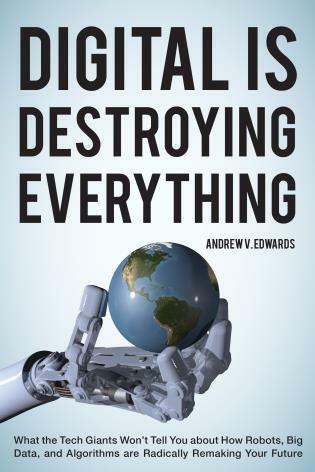 In his new book ‘Digital is Destroying Everything’ Andrew Edwards explores the wonders and every day challenges of the digital age. “When I got into digital, it was small and scrappy and nobody believed it would do much to change the world—and then it changed the world. I hope the book will raise questions, touch a nerve, and enlighten even the most dedicated digital enthusiasts." A new book is making waves in digital and beyond. Digital is Destroying Everything: What the Tech Giants Won’t Tell You About How Robots, Big Data and Algorithms are Radically Remaking Your Future is authored by Andrew Edwards, a futurist and noted digital analyst who has made a living in digital since the 1980s. Officially released on June 28, 2015 by Rowman & Littlefield in both Hardcover and Kindle, the 246 page book closely examines how digital is affecting world economies, world culture, our jobs, our relationships and our souls. The book explores some troubling possibilities in media, education, urban life, privacy and the professions--and acts as a guide through a complex subject in order to prepare us for a world to come. Despite the title, Digital is Destroying Everything (DIDE) is not a dystopian rant against all things digital—and it’s not just for techies. Instead, Andrew Edwards conducts a lively investigation into the ways technology has opened up new experiences, provided free information, and driven down costs for consumers. Edwards says, “I wanted to take the reader on a journey across a digital landscape where everything we thought we knew is different. Where digital has radically changed music, politics, retail, and financial services—and has created an environment where we seem unable to invest anything not digital.” According to Edwards, some parts of our lives are easier due to digital, but at the same time people are losing touch, losing skills, losing jobs, losing interpersonal skills, and sacrificing privacy to a digitally-driven security state. In the book, Edwards reveals how digital can compromise us personally, and how a totally reconfigured world culture will pose significant challenges for everyone. Digital is Destroying Everything has made an unprecedented name for itself online, receiving rave reviews from a wide array of individuals including professors, leaders in the digital industry and authors.